TAMPA, Fla. -- Anne Pfister of the University of South Florida has been awarded a Fulbright-Garcia Robles Research Grant to Mexico. Pfister is one of 18 students awarded Garcia Robles Research grants to Mexico. The Fulbright grant will cover the costs of round-trip transportation to Mexico, and maintenance for the academic year. Pfister is a graduate student pursuing her Ph.D. in applied anthropology with a concentration in biocultural medical anthropology at USF. She received her master’s degree in multidisciplinary studies-international education from the State University of New York and her bachelor’s degree in anthropology from Colorado State University. Her Fulbright research proposal focuses on cultural paradigms of deafness in Mexico City, and identity and language socialization among Mexican Youth. 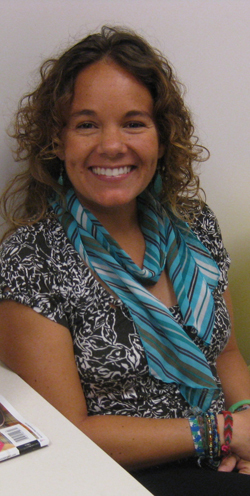 In 2010, Pfister was awarded a grant by the Institute for Latin American and the Caribbean for her preliminary research with the deaf community in Mexico City. Originally from Denver, Colo., Pfister is fluent in Spanish and continues to work toward conversational proficiency in Mexican Sign Language. Pfister represents the USF College of the Arts and Sciences, where her academic achievements have been noted inside and outside of the classroom. She has been an instructor for courses such as Examining Cross-Cultural Diversity, Cultural Anthropology and Introduction to Anthropology. In 2011, she was awarded the Provost’s Award for Outstanding Teaching by a Graduate Teaching Assistant and she was nominated for a Philanthropic Educational Organization Scholar Award, which recognizes excellence in scholarship. Her research has been published in Technology and Innovation: Proceedings of the National Academy of Inventors and has been submitted to Visual Anthropology Review and the Public Library of Science. She has presented her research at the Annual Meeting of the Florida Academy of Sciences, the International Conference for Research in the Social Sciences, the Annual Meeting of the Society for Applied Anthropology and the USF Graduate Student Organization Conference. She was a Ph.D. student representative for the Anthropology Graduate Student Organization and assisted the USF General Education Council working with colleagues on an assessment tool. She has volunteered at not-for-profit organizations in the Dominican Republic, Guatemala and Colorado, and has taught elementary and middle school students in Mexico, Florida, Arizona and Colorado. Upon her return to the United States, Pfister will use anthropological theories and methods to analyze the data collected in Mexico for her dissertation. As a collaborative investigator, her research will be informed by, and shared with the Mexican deaf community through collaborative publications, community outreach and horizontal dialogue. She plans to teach and continue research as she views both these pursuits as viable components of applied anthropology. The Fulbright Program is the flagship international educational exchange program sponsored by the U.S. government and is designed to increase mutual understanding between the people of the United States and the people of other countries. The primary source of funding for the Fulbright Program is an annual appropriation made by the U.S. Congress to the U.S. Department of State, Bureau of Educational and Cultural Affairs. Participating governments and host institutions, corporations and foundations in foreign countries and in the U.S. also provide direct and indirect support. Recipients of Fulbright grants are selected on the basis of academic or professional achievement, as well as demonstrated leadership potential in their fields. The Program operates in more than 155 countries worldwide. The Fulbright U.S. Student Program is administered by the Institute of International Education.